It seems as though it has only been a bissel since we last put fedder to paper and wrote our Christmas letter. Each year, the season draws nigh and we find many of you in our gadonka. As we sit here in the light of a kedreck candle, we reflect on the many blessings of the past year. We are first and foremost, donkbawr for the blessing of a stroobly headed baby boy. 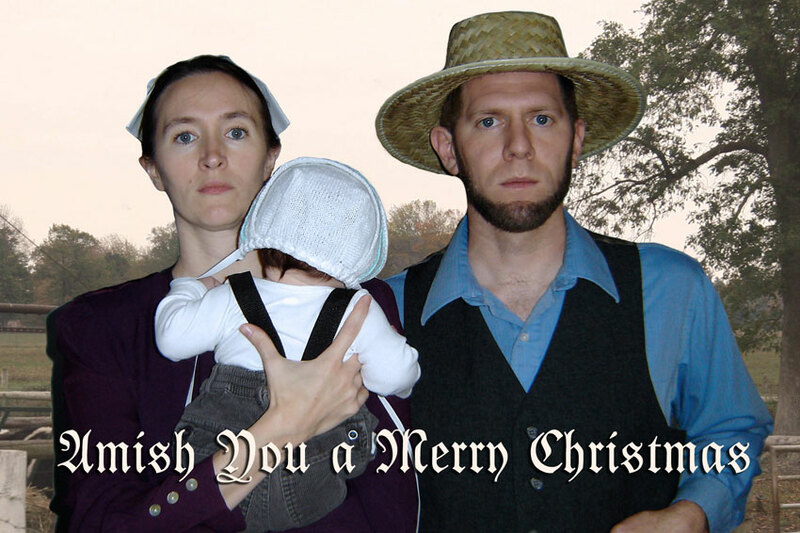 With this expensive blessing, we deemed it necessary to simplify our world and “go amish“. The savings on butter alone has been worth it. But, it has been a challenge to get the hang of speaking Pennsylvania Dutch (especially for Sara - who is more familiar with Indiana Dutch). Not all adjustments have been difficult, though. The clothes have been terribly comfortable. Many of you may be wondering how the introduction of a nochcoomer has changed our lives. To put it simply, he has ivvernooma our hearts. He’s looshtich and leddich and otherwise marickwaerdich. During the bawr-feesich pregnancy, Sara had quite the obbadit and grexed a lot. She was even able to feel his shlooxa after many of her shlovverich shloomers. Lonnie was quite shrecklich about having a schmootzich and rutz-naus honswarsht. But, to be airlich, having a nockich schrooching wee one in windla drinking his buttle has been a plesseer. But, we’re not the ainsicht ones enjoying Coyle’s brederlich company. Kiddie has fershticked him with love. She likes to buss and butz his face and clean up when he fershitts. Having an amish dog is not without its challenges. We went to great measures to teach her to use the notchthoffa and get her biggla done shnell. We’ve tried to tell her that nobody wants a ferroontzled schnoop-dooch to wipe their shnovvel. Well, we musn’t go on like a blabbermaul bobbagoy, many of you are most likely hoongerich - ferleicht for some schmecklich holiday tzooker to fersooch and fress - but not an unfershtendich amount that will be shmartlich and that greisles your bauch so much that you will gakutz in an amer. • This letter had two sides. The front side was written in a very difficult to read "Fraktur" font, as to look very Pennsylvania Dutch. The reverse was typed in a Typewriter font and very easy to read. Many folks reading had no idea until they flipped it over. • Each letter was mailed with a Pennsylvania Dutch to English Translation Key. This was easily the most difficult letter to read. It was kind of like an assignment. • Coyle made his Christmas picture debut in this one. We loved the idea of not showing his face, since that was what everybody was looking forward to. • Some friends in Pennsylvania had company visiting them and they saw the picture. 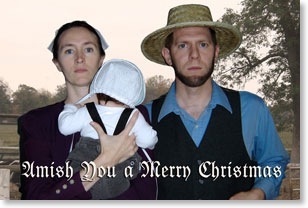 They automatically assumed that we were actually Amish and remarked that the baby wasn't showing his face because "he was Amish". • Sara's bonnet was made out of printer paper and a coffee filter. It actually looked pretty believable, although it isn't very visible in the final photo.